This week we share a Mongabay article about new forestry laws in the works in Cameroon. 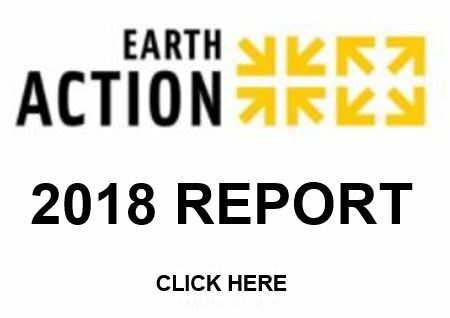 This is the third story EarthAction shares in a series of recent articles about the unfolding situation in Cameroon. Click here to subscribe to our RSS Feed so you won’t miss a post. Resting in the northwest corner of the Congo Basin, Cameroon hosts a dizzying array of biodiversity, including life-list favorites such as chimpanzees (Pan troglodytes ellioti) and forest elephants (Loxodonta cyclotis). 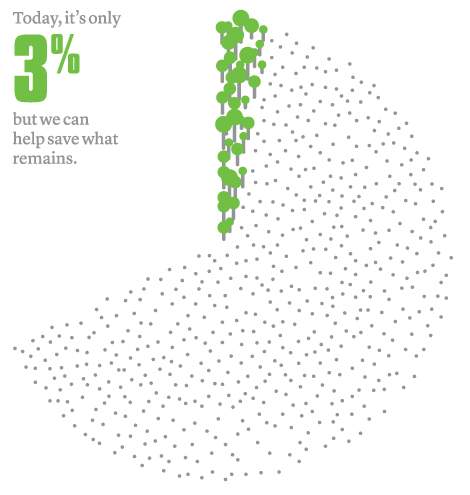 But as countries outside of Africa begin to shore up their deforestation hemorrhage by slowing or stopping forest development entirely, foreign investors are searching for new areas to expand the farming of lucrative equatorial crops. At the top of the list is palm oil. Of its expansion in Africa, primatologist and conservationist Joshua Linder said, “It’s going to come with a force.” In the late 1980s, the World Bank and International Monetary Fund started working with leaders in Cameroon to find more money to govern. Christiane Badgley, a journalist who has worked on stories and projects in Africa for more than 20 years, has had her article on Herakles Farms and their planned palm oil plantation in Cameroon published in Foreign Policy magazine. "A New York tycoon won a sweetheart deal to build a massive "sustainable" palm oil plantation in Cameroon. What followed were accusations of intimidation, corruption, bribery, and deceit." 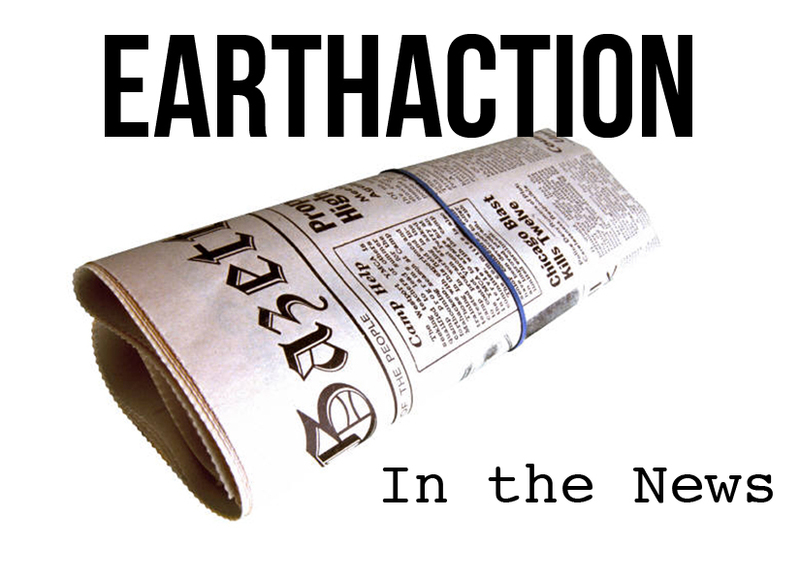 This is the first story EarthAction shares in a series of recent articles about the unfolding situation in Cameroon. Click here to subscribe to our RSS Feed so you won’t miss a post. In 2009 Herakles Farms negotiated a deal with the Cameroonian government to cultivate a palm oil plantation in a region known for its rain forests and diverse animal population. The plantation would be more than 12 times the size of Manhattan. Herakles Farms claimed that upon implementation, the plantation would be one of the biggest commercial palm oil operations in Africa. The project has been very controversial. Locals have accused the company of using donations of goods and services to gather support. Scientists have argued against Herakles' claims of environmental sustainability. Many observers question the economic benefits promised, fearing the project is much more likely to strip local communities of land and livehiloods than it is to lift them out of poverty. Christiane Badgley: "Standing there, amid the desolation, I recalled the voices of local villagers: The forest is our life. Because of the deal their government struck with Herakles Farms, that life is now in danger." TAKE ACTION Our friends at Greenpeace have set up a quick and easy way for you to send a message to the Cameroon Minister of Forest and Wildlife and other important policymakers to save this forest. Reynaldo - Rainforest Hero has won Best short film at the UN Forest Short Film Festival, the UK Green Film festival and Inkafest in Peru! 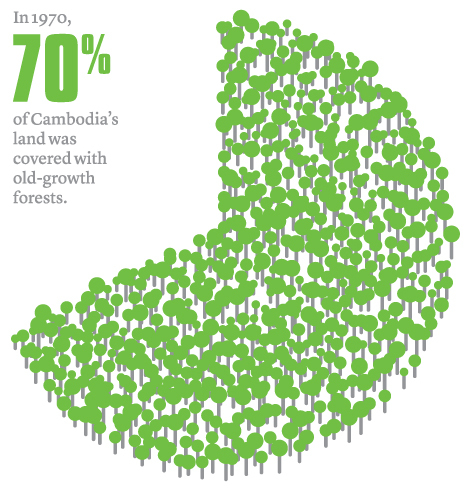 Over 40,000 hectares (100,000 acres) of the Prey Lang rainforest in Cambodia were thought to have been saved after the Royal Cambodian Government cancelled four major economic land concessions in 2012 and designated Prey Lang as a conservation area, protected from all logging. This was hailed as a major victory for environmentalists and local villagers and the Prime Minister was re-elected to another term. But now, the Prime Minister and his government are not enforcing the law! Illegal logging within the forest is expanding while the government remains silent and inactive. Despite the dangers, the local villages are reduced to patrolling the forests on their motor scooters to confront and stop the illegal loggers. The Cambodian Prey Lang Network needs the support of organizations and people worldwide and they are asking for your help. 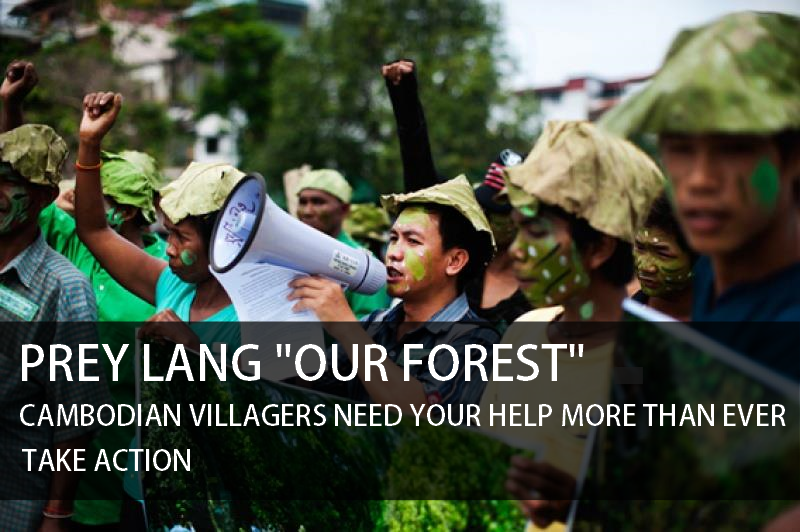 Please help the people of Prey Lang to protect their home and life-giving forest. Writing directly to Prime Minister Hun Sen is an effective way to let him know that the whole world is watching. Ask him to enforce Cambodia’s environmental laws and stop the illegal logging in the Prey Lang forest. 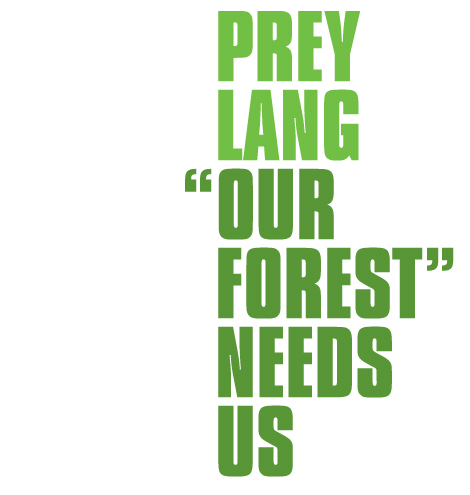 Also ask him to work with and include input from the citizens in the Prey Lang region to develop and implement a long-term sustainability plan for the Prey Lang area. Click here to sign a petition to Prime Minister Hun Sen sponsored by the Prey Lang Network. Armed soldiers are breaking up villagers' protests and meetings. In 2012, Chut Wutney, the director of the Natural Resources Protection Group, was shot dead at a military checkpoint. Chut Wutty, the Founder and Director of the Natural Resource Protection Group (NRPG), has been shot dead in an incident in Koh Kong province in which military police officer In Rattana is also said to have died today, 26 April 2012. The details of the incident in which the two men died remain unclear but their deaths have been confirmed by military police spokesman Kheng Tito. Wutty’s death has also been confirmed by his nephew, Chuon Phearum, as well as Koh Kong provincial military police chief, Thong Naron. According to The Phnom Penh Post (‘Environmental activist Chut Wutty shot dead’) the incident occurred today at 12.30 pm in Koh Kong’s Veal Bei commune, Mondul Sima district. Two journalists from The Cambodia Daily are reported to have been accompanying Wutty but are said to have been unharmed in the incident which occurred near the Central Cardamom Protect Forest. Wutty has been subject to threats in the past as a result of his work in this area. In 2001 as part of a small Conservation International team sent to patrol for illegal logging in the Cardamom mountains, he was threatened by a military commander who said he would kill him over his investigations into illegal logging. He had to flee his hotel and rent a boat in the middle of the night that took him to safety. In the face of continued threats and harassment, as Director of the NRPG, Wutty, a former soldier, has advocated tirelessly against the ongoing destruction of Cambodia’s natural resources. In 2011, he was threatened with arrest and criminal charges as a result of his work raising awareness of the destruction of Prey Lang forest in the Northeast of the country. In August and September, two training events he conducted with the Cambodian Center for Human Rights (CCHR) in Kampong Thom province for community members affected by the destruction of Prey Lang forest were disrupted by police and military police armed with AK-47s. Wutty is survived by his wife, two daughters and a son. In this terrible time, the thoughts and prayers of the staff of CCHR are with Wutty and his family.